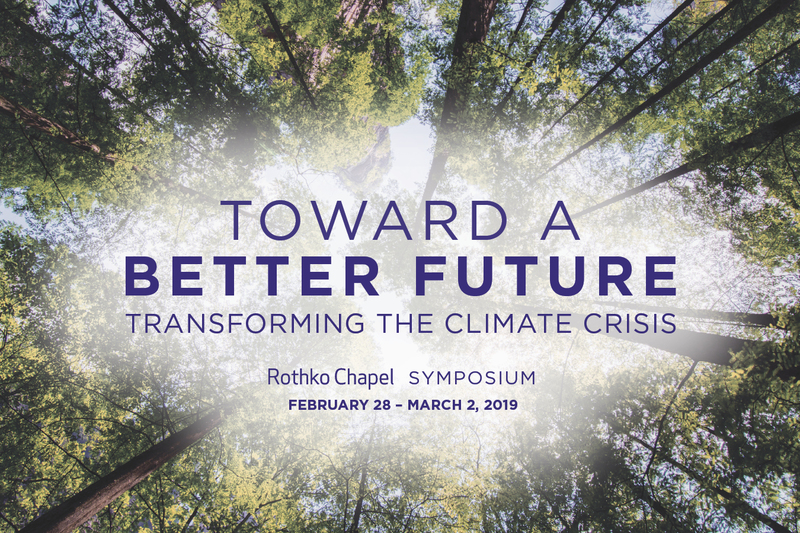 The Rothko Chapel and University of St. Thomas hosted a three day symposium exploring the current climate crisis, its impact on vulnerable communities, and mitigation efforts being implemented locally and nationally. Given the global interconnectedness of the climate crisis, the symposium explored how best to move to a zero emission, low carbon economy through the engagement of presenters from religious, Indigenous, public health, energy, government, philanthropic, academic and arts sectors and communities. A central focus was on individual and institutional actions, practices and policies that must be taken to create a more livable and equitable future. Climate change is not only about the planet--it's about the past, present, and future of the people who live here. Sengupta shared reflections from her writings about the human toll of climate change on vulnerable communities around the world. Somini Sengupta, The New York Times’s international climate reporter, tells the stories of communities and landscapes most vulnerable to the effects of climate change. A George Polk Award-winning foreign correspondent, she has reported from a Congo River ferry, a Himalayan glacier, the streets of Baghdad and Mumbai and many places in between. As The Times’s United Nations correspondent, she reported on global challenges from war to women's rights. Her first book, The End of Karma: Hope and Fury Among India's Young was published in 2016 by W.W. Norton. She grew up in India, Canada and the United States, graduating from the University of California at Berkeley. This interfaith conversation explored the map of climate change and how to navigate it through the lenses of Christian, Jewish, Hindu and Sikh traditions. Panelists spoke about what they see as possible paths to take, and whether we might reimagine new ones going forward. The impact of climate change is vast—impacting our countries, cities, communities, homes and each of us on a personal level. This conversation explored the physical, psychological and spiritual effects of the changing climate, engaging the perspectives of a public health official, a research psychologist, and an Indigenous leader from the Lakota Tribe. This presentation and conversation included a pre-recorded message and poetry video from Marshall Islander poet Kathy Jetñil-Kijiner. From oyster beds in Louisiana, to the Quinault Indian Nation in Washington state, low income communities and communities of color are disproportionately impacted by the changing climate. This presentation and discussion shared firsthand accounts of the realities three specific communities currently face, including their work toward change and the creative opportunities that arise to combat these injustices. This cross-sector, interactive session shined a light on the perspectives and work of scientists, economists, policy makers, environmentalists, and engineers, and included presentations, breakout discussions and a moderated conversation. Climate change is causing extreme weather conditions worldwide: entire communities are destroyed by catastrophic events driven by hurricane force winds, water, drought, and fire. Hurricane Harvey exposed a collective "failure of imagination" to fathom its widespread havoc-wreaking power. Houston-based artist Maria Cristina Jadick respondes to these climate realities with multimedia sculpture and installation. Iceland is a country known across the world for the beauty of its 400+ glaciers. But it is now losing 11 billion tons of glacial ice each year because of global warming. In 2014, Icelandic scientists announced that the country's first major glacier, Okjökull (known to most by its nickname "Ok"), had ceased to be. In 2017, U.S. anthropologists Cymene Howe and Dominic Boyer teamed up with Icelandic filmmaker Ragnar Hansson to make a documentary film about what losing their first glacier means to Icelanders and what it should mean to all of us. The people who are the least responsible for climate change are the ones who will be the most impacted long-term. Knowing this, they are taking the lead in making their demands for a livable climate known to the leaders of our cities and countries. This panel explored what young leaders from different parts of the country are doing to lead us toward a better climate future. Examples included a class action lawsuit against the government, a national youth-led protest march, and joining local advocacy groups and empowering young people to make change. Moderator: Estrella Sainburg, GreenFaith Organizer. Our current climate crisis demands that we identify new modes of communication to convey the urgent moment we find ourselves in and to demonstrate why people should care. This presentation and conversation followed the work and perspectives of an artist, former coal miner, environmental journalist and Indigenous leader. The Honorable Mayor Sylvester Turner gave a short address on climate initiatives in the city of Houston. Positive climate change outcomes depend on sound legislative decisions at the local, state, and national levels. Attendees learned about current policy initiatives and how we can be more effective advocates. Moderator: Elizabeth Love, Senior Program Officer for the Houston Endowment, Inc. There was an onsite interactive Poet-Tree station created by Writers in the Schools’ Bayouth Collective. Many thanks to our promotional partners: Asia Society Texas Center; BikeHouston; Buffalo Bayou Partnership; Citizens' Environmental Coalition (Houston); Houston BCycle; Houston Climate Movement; Interfaith Environmental Network of Houston; The Jung Center of Houston, Texas; Lone Star Legal Aid; The Mind, Body, Spirit Institute at the Jung Center; Plant It Forward Farms; Public Citizen; and Sisters of Charity of the Incarnate Word. For more information on event logistics and frequently asked questions, please click here.